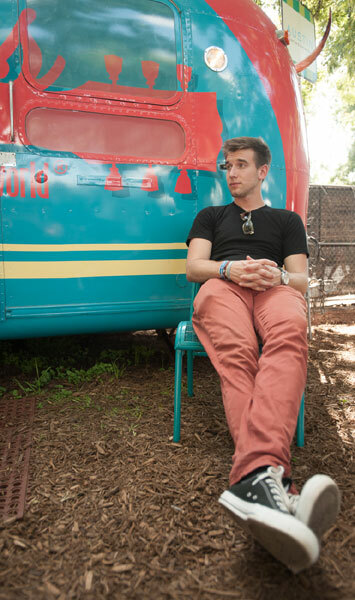 Recently signed to Atlantic Records, Austinite Max Frost knows exactly where he came from and where he is going. Never mind that he labels himself a blues-playing guitar player who sings with a soulful voice and also produces hip-hop — this 21-year-old multi-instrumentalist creates music that has a retro feel and yet still feels modern. Jessica Alexander was able to meet up with him during Austin City Limits Festival 2013 to learn more about this multi-talented songwriting musician. Signing to Atlantic Records is a huge deal. Congratulations are definitely in order. You were a student studying English at year ago at University of Texas. The use of hi-fi and lo-fi throughout your upcoming EP Low High Low is a welcome change of pace to the ears. These are modern songs, but with an old-school feel. I love how elements of this record are juxtaposed together. It’s a dynamic and emotional release, and I will further explore these ideas with my full-length album set to be released in spring 2014. My understanding is that you record all of your tracks alone. Tell us how working with a band changes the way you work or think as a musician. I am still able to make my own statement with my own backing band. I tend to prefer co-creation for making music, but I am still very much able to keep my own voice when working with others. Max Frost’s first EP release, Low High Low, comes out Tuesday, October 8, 2013.